Summer is here, and whether you need to feel a little sun and surf at your house, or you have a sunny beach house to decorate, the United States Flag Store has some awesome summer banner flags to make your home look great this July and August. All of our banner flags, including our summer flags, are made from top quality nylon and polyester and printed in vibrant colors. Read on to learn more about our summer flags featuring sunshine and water. The Summer Splash Banner Flag will make you want to jump right into summer. This flag is made from polyester, is designed for vertical display, and is printed in beautiful, bold colors. The flag features a swimming pool with a diving board in the front. In the swimming pool is a beach ball splashing into the water. A colorful umbrella appears against a blue sky in the background. The bottom edge of this flag is wavy for a true splash feel. Order this beautiful flag today for only $24, a savings of almost $5 off the list price. The Sun Feather Banner is another great way to decorate your garden or yard and celebrate the sunshine. This feather banner is made from printed nylon and has a bright blue background. The banner features the words “It’s hot hot hot” at the top with a smiling sunshine at the bottom. 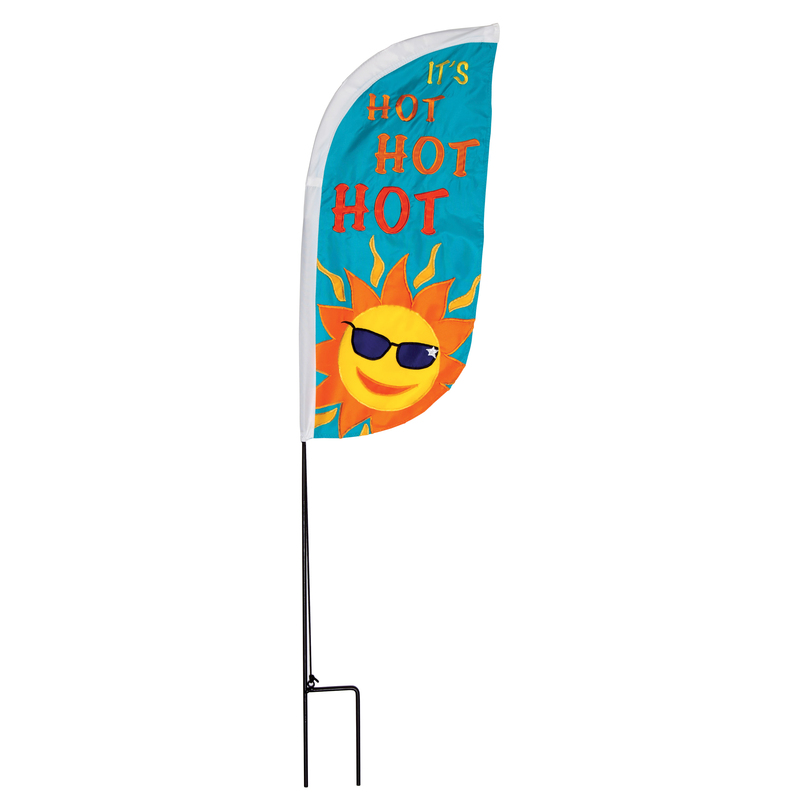 This flag is a great deal at only $12.50 with the pole included! Are you looking for a great way to celebrate summer? The United States Flag Store has a great selection of beautiful summer banner flags to help make your home look sunny this July. All of our banner flags are made from top-quality nylon and printed with vibrant and bright colors. As always, you’ll find that we sell our flags at unbeatable prices, especially when compared to stores and other online sites. Read on to learn more about some of our summer decorative banner flags. 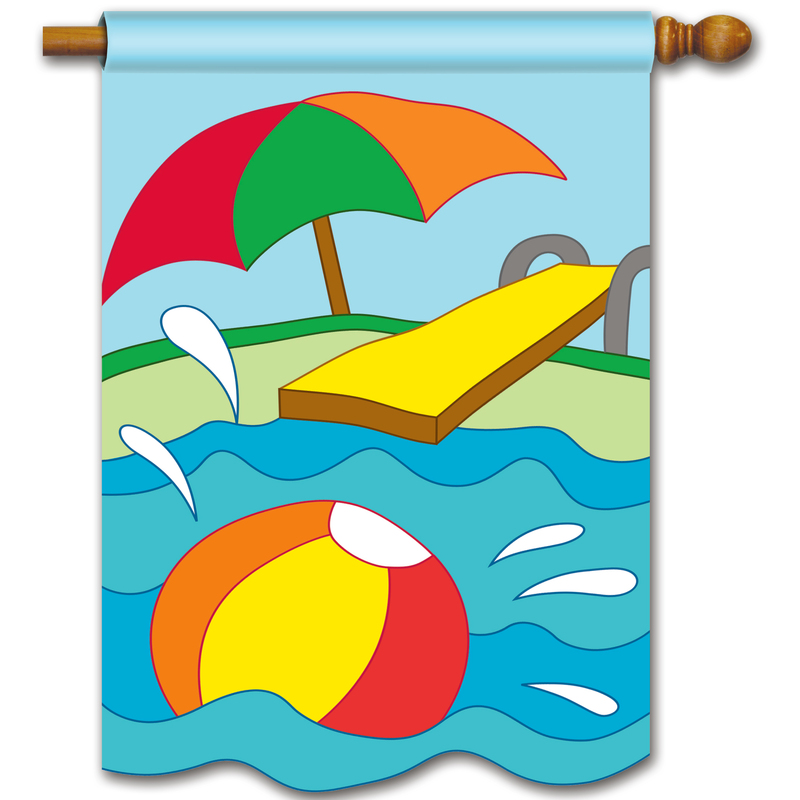 The 3-foot by 5-foot Summer Decorative Banner Flag is a great way to celebrate all of summer’s fun activities. The flag is made from printed nylon with vibrant colors. This flag has a yellow background reminiscent of the sun’s rays and the word “Summer” printed across the flag in bold, block letter. Inside each letter is a different summer activity or theme, including sunshine, baseball, beach vacations, golf, and, of course, watermelon! Order this wonderful flag today for only $32.69, a savings of over $3 off the list price! The 3-foot by 5-foot Summer Ladybug Decorative Banner Flag is an adorable flag to decorate your home with this season. This 3-foot by 5-foot nylon flag is printed with vibrant colors on a white background. 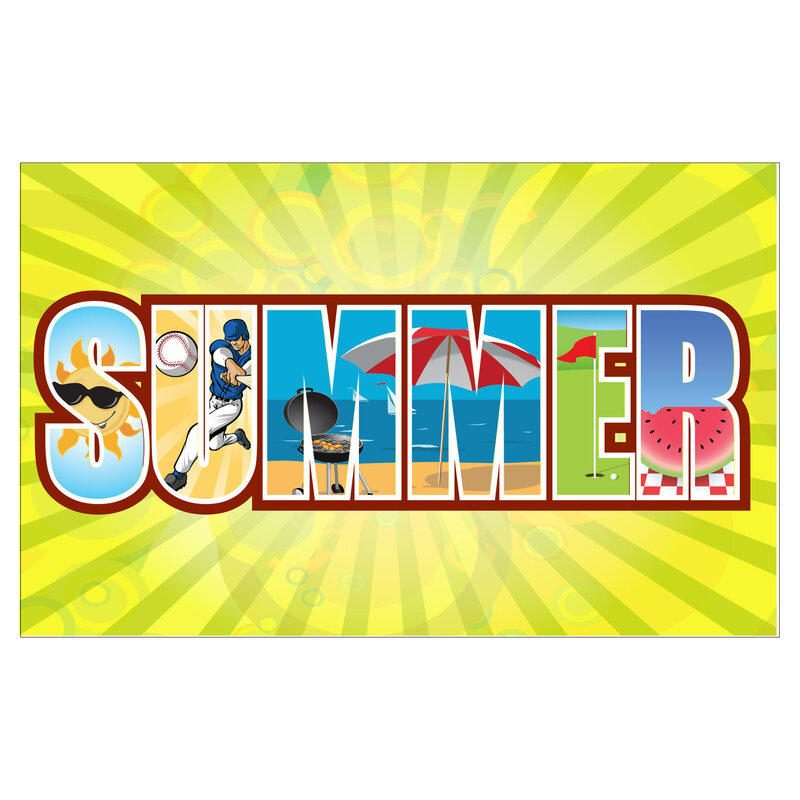 Across the bottom of the flag is the word “Summer,” and a cute, large ladybug appears over the top of the word leaving a little black dotted trail. This beautiful flag is available at the United States Flag Store for only $27.29, a savings of almost $3 off the list price! Independence Day is quickly approaching, and if you’re having a 4th of July gathering to celebrate the day, you’ll need some great patriotic decorations. You know that the United States Flag Store has high-quality American flags and accessories at unbeatable prices, but we also have great deals on patriotic decorations, including centerpieces that will make your picnic or dining room table look great! Read on to learn more about just a few of our patriotic centerpieces. The Mini Stars Patriotic Centerpiece is a foil centerpiece that will add both color and patriotism to any table. 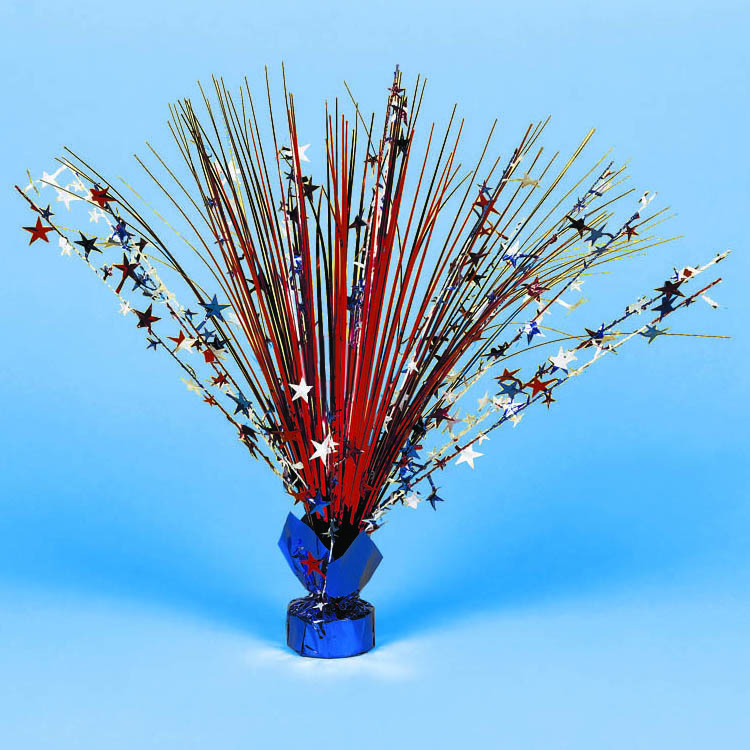 This center piece is 8.5 inches tall and features foil streamers that spread outwards with red, white, and blue mini-stars for a festive and patriotic look. The centerpiece comes with a weighted base to keep it from falling over. 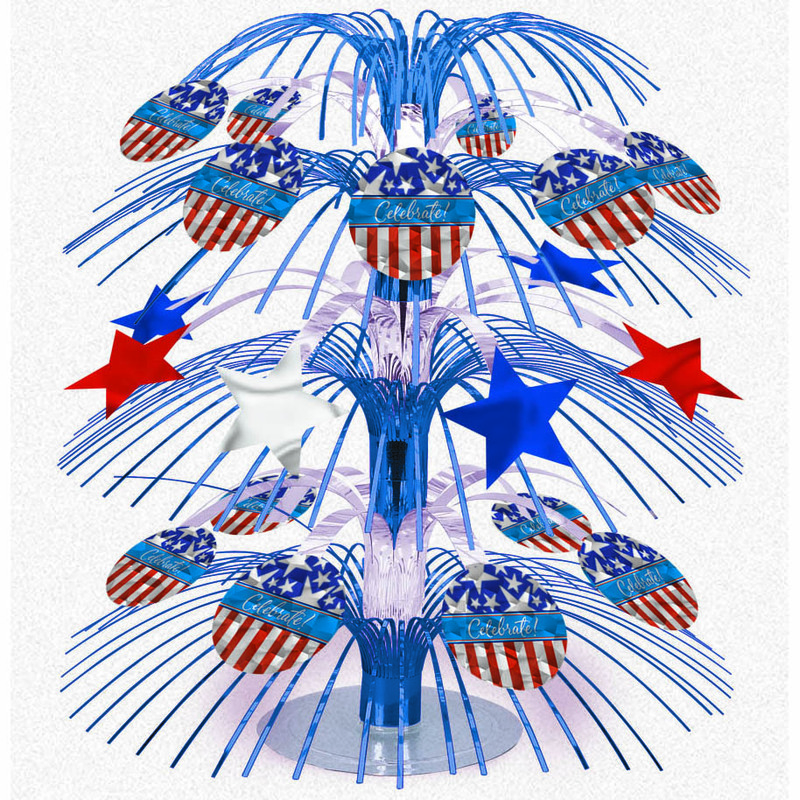 This centerpiece is a great way to add some fun to your Independence Day gathering. Order a few of these today for only $1.89 each. T he Patriotic Spray Centerpiece is another great way to add some festive patriotism to your tables. This centerpiece is taller than the Mini Stars Centerpiece, and measures 18 inches. The design of the centerpiece includes red, white, and blue foil streamers bursting out of the base with red, white, and blue stars, too. The weighted base is wrapped in blue foil, making it both functional and attractive. Order these beautiful centerpieces for your Independence Day party today for only $3.39 each. 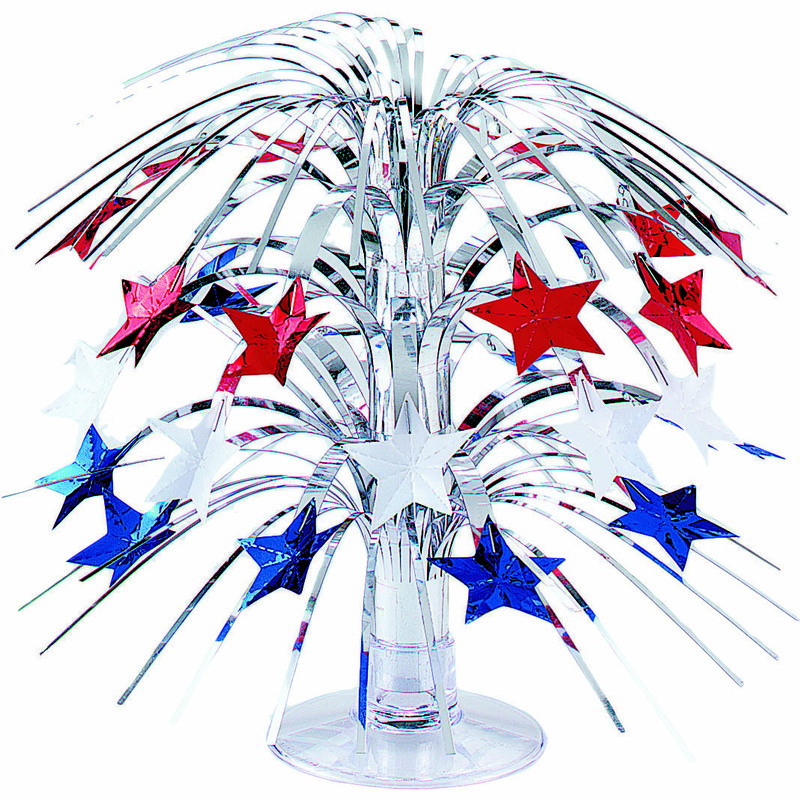 The Patriotic Prismatic Centerpiece is truly a festive decoration for Independence Day. This c enterpieces features blue streamers branching out from the center. The centerpiece is also decorated with red, white, and blue stars, as well as prismatic circles with American flag features and the word “Celebrate” printed in script across the prism. These centerpieces are 18 inches tall and are available for only $4.99 each. Keeping your American Flag illuminated at night is recommended in the United States Flag Code, unless the flag is lowered at sunset. But keeping your flag pole lit all night can increase your electric bill significantly. One remedy to this problem is to use a solar flag pole light. At the United States Flag Store, we have a great selection of solar flag pole lights that are powerful enough to use with in-ground flag poles. Read on to learn more about our great selection. 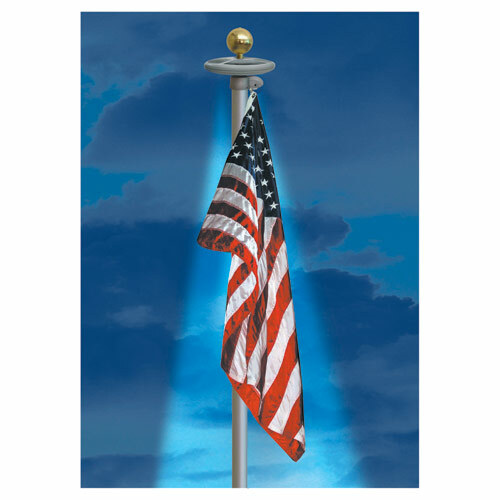 Our Online Stores Brand Flag Pole Solar Light is an easy and economical way to keep your American Fla g illuminated. This flag pole light is simple to install, with no wiring required. The light simply collects energy from the sunlight during the day, absorbing it with solar panels, and uses that energy to illuminate your flag pole at night. 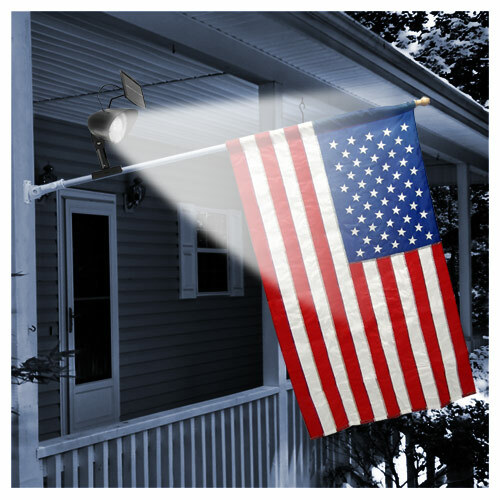 The flag pole light doesn’t compromise on brightness, either, with 20 LEDs and a 10-inch diameter, your American flag will be beautifully illuminated. This flag pole light is designed for use with in-ground flag poles between 15 and 25 feet in length. The 0.5-inch diameter hole through the light is designed to fit on standard spindle threading for flag pole ornaments. Order this great light today for only $69.99, a savings of $10 off the list price. The Solar Flag light by Valley Forge is another great solar flag pole light option. This light is easy to install with absolutely no wiring required. The solar light panels absorb energy from the sun throughout the day and then illuminate your flag at night with a bright white 100 LUX output that provides light for 6 to 12 hours, depending on weather conditions. Order this great flag pole light today for only $129.49, a savings of nearly $14 off the list price. Flag Day is coming up on June 14, and Independence Day will be upon us on July 4. One of the best ways to honor these important days on the US calendar is to purchase and fly an American flag. At the United States Flag Store’s online store, we have a great selection of all types of American Flags. We are particularly proud to offer beautiful American flags from the Valley Forge Heritage Series. Like all Valley Forge flags, these banners are 100% made in the United States, but they feature a patented antiquing process for a beautiful vintage look. Check out two of the Heritage Series Flag Kits, giving you everything you need to fly your flag with pride. The Valley Forge Betsy Ross 13 Star Heritage Series Flag Kit comes with everything you need to fly the Betsy Ross flag. 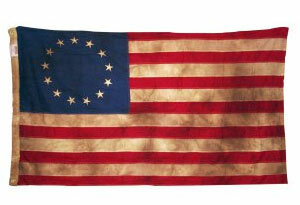 The kit includes a beautiful 2.5-foot by 4-foot Valley Forge Sewn Cotton Heritage Series American Flag. This flag features the original design, which included the thirteen alternating red and white stripes, but only thirteen stars for the thirteen original colonies. The flag has been tea stained with Valley Forge’s patented antiquing process. The kit also comes with a two-piece mahogany stained wood flagpole that is 1 inch in diameter and 5 feet long. You’ll also receive a fixed bracket and carved pine cone wood finial. Order this great kit today for only $54.95. The Valley Forge USA Heritage Series Flag Kit is a great option for those looking for an antiqued flag kit with the traditional US flag design. This kit comes with a 2.5-foot by 4-foot Valley Forge Sewn Cotton American Flag in Valley Forge’s heritage series, so it has been tea stained with a patented antiquing process. The kit also comes with a two-piece mahogany stained flag pole that is 1 inch in diameter and 5 feet long, a fixed brass bracket, and carved pine cone wood finial. Order this great flag today for only $54.95. Independence Day is just around the corner, and if you’re hosting a party or gathering, you’ll need patriotic decorations to celebrate the day. 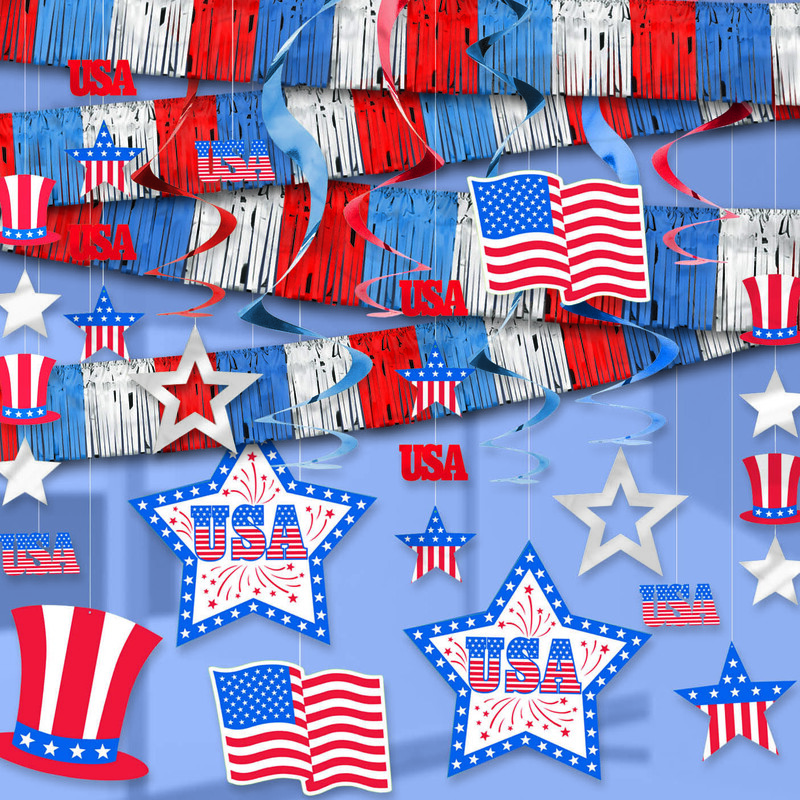 The United States Flag Store is here to help, with a great selection of patriotic party supplies, including centerpieces, invitations, table cloths, and more. But if you’re looking for an easy way to decorate your home for the 4th of July, check out our Patriotic Decorating Kits. They come with everything you need to let your patriotism shine! 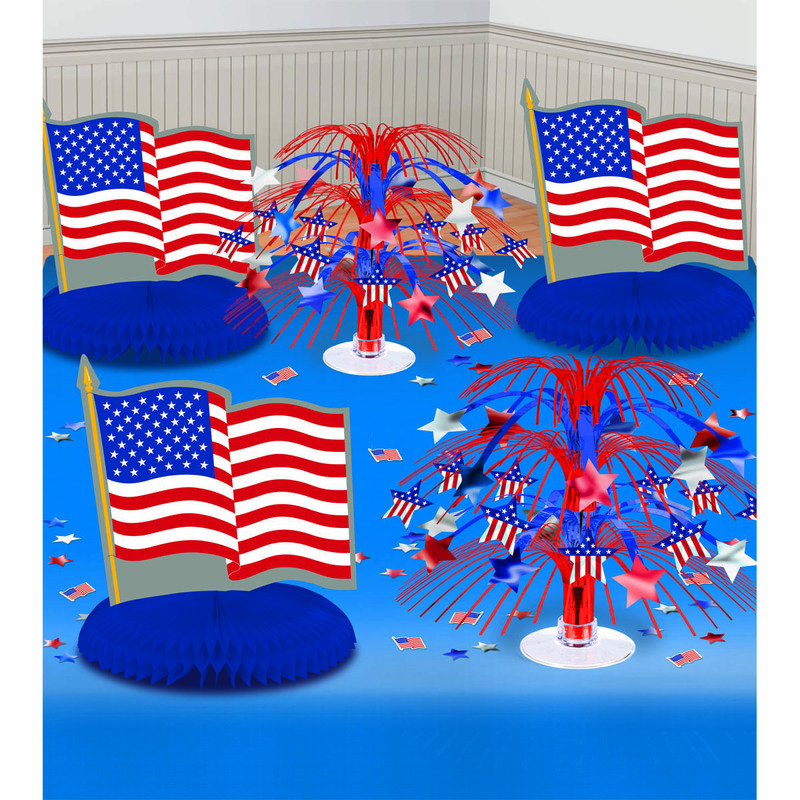 The Patriotic Room Decorating Kit includes everything you need to get your Independent Day gathering looking festive, colorful, and, of course, patriotic. The kit includes four foil swirls, two are 36 inches long and two are 24 inches long, that can be hung from the ceiling or windows. The kit also includes 4 hanging string decorations that are three feet and four feet long with patriotic American flag stars hanging from the bottom. Four flag cutouts that are 15 inches and 12 inches, as well as a 9-inch hat cutout are also included in the kit. And no 4th of July party would be complete without garland! The kit includes four garlands total, two are 10 feet by 5 inches and two are 10 feet by 15 inches. Order this great kit today for only $19.99, a savings of $4 off the list price! The Patriotic Table Decorating Kit will add festivity, color, and patriotism to any 4th of July table, indoors or outsid e. The kit includes 4 honeycomb centerpieces that are 10 inches tall. These centerpieces have a wide blue honeycomb with an American flag displaying vertically. The kit also includes 6 mini cascade centerpieces that are 8 inches tall. These cascades have a weighted plastic base with red, white, and blue foil streamers and patriotic stars cascading from the center. With a bag of confetti to top it off, you can’t go wrong. Order this great kit today for only $21.99!